At the recent Japan Travel Mart held in Yokohama, we had the opportunity to sample a variety of evening activities that were impressive, tasty, fascinating, educational, energetic, and just plain fun! The first night was an introduction to Yokohama where we could sign up for either an evening of food and hands-on creativity at the Cup of Noodle factory, or take the Izakaya bar cruising option. I happen to love Izakaya culture which involves traditional small, usually family-owned bars, that serve tasty snacks or meals, along with one’s beverage of choice: beer, sake or shochu. Nogeh Street is the main thoroughfare in an area filled with literally hundreds of Izakayas, restaurants, standing sake bars and regular bars and extends down the numerous side streets. The deal was that we could choose two restaurants from a list and enjoy some tasty treats and a drink. We immediately dashed to our first choice, Nishiki Sushi, where there happened to be two seats left amongst the fifteen or so, available. We ordered Sapporo Beer and a sushi platter and fell into one of those melt-in-your-mouth sushi trances that one can only experience in Japan. Ahhh… if only Toronto sushi could taste even half as good as this! But the place was under attack by all the other Travel Mart attendees now (literally) chomping at the bit to get into the Izakaya, so we finished up and headed off for our second treat of the evening. 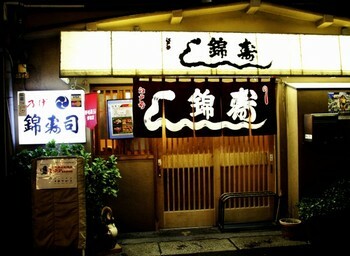 Yasu Bei is a very small Izakaya specializing in Yakitori, which are small bamboo skewers of grilled marinated meat and they are soooo delicious. In fact, once our set dinner was finished, we stayed in the restaurant for some time, trying different dishes, sampling the sake and chatting with other Travel Mart-ers. Thoughts of good food as well as finding time during the conference to return to the area to try out more Izakayas, turned the 20 minute walk back to the Intercontinental Hotel a very quick jaunt. But more lay in store. 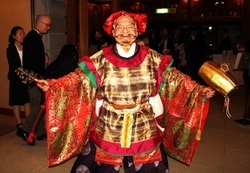 The official Opening Night of Travel Mart took place at the Noh Theatre. Having attended a Kubuki performance a few years ago, I was looking forward to learning about Noh. When we arrived at the theatre. the performers were already in engaged in short skits in the entrance hall, to give the audience some insight into the masks, the intricately crafted costumers and character development. Noh, which grew up in the 14th century as a combination of Chinese art and Japanese dance, and originated at the same time as the tea ceremony—which we were invited to attend in another part of the theatre. Delicious powdered green tea was carefully prepared and then served in bowls, one at a time, with kneeling, bows, respect and care. We were then invited to see a sampling of 5 plays in the actual theatre. The stage is quite simple and features a painting of a pine tree on the back wall, which some believe reflects the fact that originally Noh theatre was performed out of doors. Unlike Kabuki where men perform as both male and female characters, in Noh, men and women both perform. Some of the short plays were silent, sad and thought provoking, one was loud, boisterous and the actions and speech of the actor were hilariously funny (and we did not need to speak Japanese to appreciate this) and other plays were creative, dramatic and gripping. On the whole it was a fascinating evening. Today, Noh theatre is making a comeback with young people. The traditional day-long plays are condensed at times and fit into an evening that might consist of two plays. For many seeking a night out, Noh is the way to go! 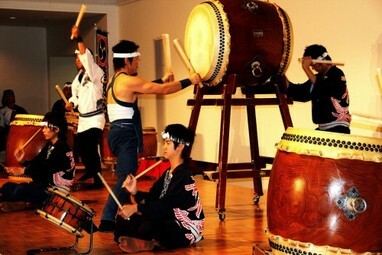 Our last evening took place in the Pacifico Yokohama Convention Centre and featured the Taiko Drummers. The combination of tympanic energy and rhythm and the determined facial expressions of the young performers was electrifying. And then, following a dinner buffet, a huge tuna fish, caught off the coast of New York State, was transformed before everyone’s flashing cameras, into the tastiest sashimi for the 300 Travel Mart attendees to sample.